Raith Rovers slumped to their first defeat of the pre-season, after a comprehensive 4-0 victory for York City at Stark’s Park. Grant Murray made three changes from Saturday’s 1-1 draw with St. Johnstone. Paul Watson made his first start of the summer, partnering Laurie Ellis at centre-half, while Ross Callachan was alongside Liam Fox in midfield. Mark Stewart was restored to the right of midfield, with Grant Anderson returning to the substitutes bench. York City had looked like they were going to be involved in a relegation struggle during the last campaign, but they ended the season on a run of 17 games unbeaten, a spell that saw them end up as play-off participants by the season’s end. They headed into the match on the back of a 2-0 friendly defeat to Sheffield Wednesday at the weekend, and like Raith, have been involved of something of a rebuilding job over the summer, with Nigel Worthington making eight signings during the close season. One of those was goalkeeper Jason Mooney, and the imposing, six-foot nine-inch stopper had to be alert after just three minutes, when a cross from the right was met by the head of Calum Elliot. Mooney may not have known too much about it, as the ball struck his chest and bounced clear, but the Raith striker perhaps should have done better from just a few yards out. 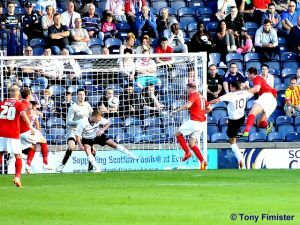 Within seconds, play had swung down the other end, and Raith found themselves a goal down. A Paul Watson back pass was hacked at by Laidlaw under pressure, and his poor clearance only travelled as far as Michael Coulson. With Laidlaw out of position, it looked as if the York forward was about to slot it home, but a foul by Watson just outside the area, temporarily averted the danger. From the free-kick however, Coulson bent his effort around the wall, and inside Laidlaw’s left hand post. Despite getting his hand to the effort, the Raith keeper was unable to keep it out. The game was in its infancy, but it was clear that both Raith full-backs were going to have their hands full, with York wide men, Lindon Meikle and Anthony Straker both impressing early on. Despite that, Raith were the next to come close, with three set-pieces, the first after ten minutes. Conroy’s angled, twenty-five-yard attempt appeared to be heading into the top corner, but Mooney tipped it wide, and from the resultant corner, Nade headed narrowly past. Conroy again went close ten minutes later from a similar position as his first free-kick, but despite firing a low shot past the wall, he was again denied by Mooney. If the game felt reasonably well-balanced at that point however, that would all change within quarter-of-an-hour. York extended their lead after twenty-five minutes, after some poor defending from a corner. Straker’s cross was headed in by Dave Winfield, unhindered by any Raith defender, despite his effort coming from close range. By the thirty-third minute it was three, and again it was the result of some poor defending. Straker strode into a huge gap that appeared in-front of him, and he played the ball out wide to Ryan Jarvis, who also had time and space down Raith’s right-hand-side. His cross found Straker who had continued his advance, and the Grenada international finished the move off from inside the six-yard-box. By this stage Raith had fallen completely out the game, with little or nothing coming off, either offensively or defensively. Indeed, it was almost 4-0, before half-time, when Ellis lost out in the middle of the park to Meikle, but after finding himself with space inside the box, he blazed his shot over. It was the final act of a half that had been bossed by an away side that seemed fitter, sharper and quicker, but any thoughts that Raith could make some inroads into the deficit in the second period, seemed forlorn, when York spurned three good opportunities to get the fourth, within five minutes of the restart. Jarvis was the main protagonist at this point, twice going close in the opening moments, then, from a short corner routine, the ball was fizzed across goal, and looked set to be turned in, but for some frantic defending on the line by a number of Raith players and Laidlaw. The pace of the play noticeably slowed at this point, with York perhaps feeling that their job was done, although they were still very much dominating possession. With just under an hour gone, Worthington brought on former Dundee and Dunfermline striker, Jake Hyde, and the new signing wasted little time in showing his new team-mates what he’s capable of, with the goal of the night after sixty-two minutes. Allowed too much time and space twenty-five yards from goal, Hyde curled an effort in off the inside of Laidlaw’s post to make the score 4-0. By this time Raith had made two substitutions of their own, Grant Anderson replaced Mark Stewart, while Lewis Vaughan came on for Calum Elliot. Despite Vaughan testing Mooney with Raith’s first effort of the half after seventy minutes, the flow of the game was well and truly towards the other end. Laidlaw had to parry away another Hyde effort after some good work by left-back Femi Ilesanmi, and the Raith keeper had to be at his best a minute later to tip wide a Coulson header. A combination of the post, and Laidlaw then denied York a fifth goal from an acute angle, and this would be the youngsters last action of the match, as David McGurn was welcomed back onto the park, for his first appearance since October. He was almost called into action straight away, as Michael Coulson curled a chance just wide after being presented with an opening, then the same player had to watch his free-kick attempt tipped over by McGurn. A few moments later, Coulson was again aggrieved to see his deflected effort ricochet off a post to safety, after a brief spell of Raith possession had broken down in midfield. The 4-0 scoreline and disappointing performance meant that positives seemed in fairly short supply, although the return of McGurn brought a huge cheer from the Rovers fans, while Paul Watson was also able to get his first warm up game under his belt. The final friendly before the season starts in earnest against Dunfermline, is at Stark’s Park this Saturday, as John Hughes brings his Inverness side to Kirkcaldy. We welcome the Minstermen, to a warm and sunny Starks Park. Raith Rovers supporters will be pleased to see Davie McGurn listed as a substitute. City fans making a lot of noise in the Main Stand. Mooney saves a point blank save from Elliot's header. Coulson with a free kick, curls the wall and the ball goes under a diving Laidlaw. Laidlaw quick to snuff out a Coulson cross. Meikle is proving troublesome on the right. Conroy from the corner of the box fires towards the postage stamp forcing the best out of the keeper. From the corner, Nade comes clos with a glancing header. Ilesanmi swings a ball in from the right but no City takers. Winfield tries a spectacular back post header but fouled Laurie in the process. Conroy hits a low free kick forcing a low diving save from Mooney. Straker shoots and Watson blocks for a corner. Goal City, Straker with a corner to Winfield who heads the ball home. The sun goes behind the clouds giving fans in the South Stand respite. Ilesanmi tries from distance, his tame effort easily recovered by Laidlaw. Coulson from twenty yards forces Laidlaw to spill the ball but he quickly gathered to clear. Jarvis breaks on the left and crosses for Straker to side foot home from six yards Goal City. Meikle breaks free and shoots, his delivery going high and wide. We have had some signal trouble. Rovers trying to steady the ship. Straker and Ilesanmi combining well but their attack is stifled by Watson. Jarvis and Lowe off, Platt and Hyde on. Sub Montrose beats offside, passses to Coulson shoots and Laidlaw scrambled a save. Goal City, Hyde slots past Laidlaw. Rovers get a bit of possession but Nade's pass to Anderson is wasted. Subs, McGurn, Anderson, Vaughan, Bates, Matthews, Court, Trialist, Trialist, Law. Mooney, McCoy, Ilesanmi, Coulson, Penn, Jarvis, Straker, Lowe, Winfield, Meikle. Subs, McCombe, Montose, Platt, Murray, Hyde. Femi and Christian go for it.